Long-term climate strategies are an important instrument to help policy-makers and relevant stakeholders to establish a direction towards a climate-friendly future. The Paris Agreement asks all countries to establish such strategies – and EU Member States will soon be committed under EU law to produce them by 2020 at the latest. Not all EU countries have tried to establish plans that long into the future (up to 2050 and beyond) and the existing ones differ in scope and specificity. There is thus a need for exchange of the current experience and a sharing of best practice – including improving the understanding of the underlying modelling and scenario work. The Climate Recon 2050 project brings together policymakers from EU Member States, as well technical experts and climate modellers in two parallel fora to provide a space for exactly such a dialogue. 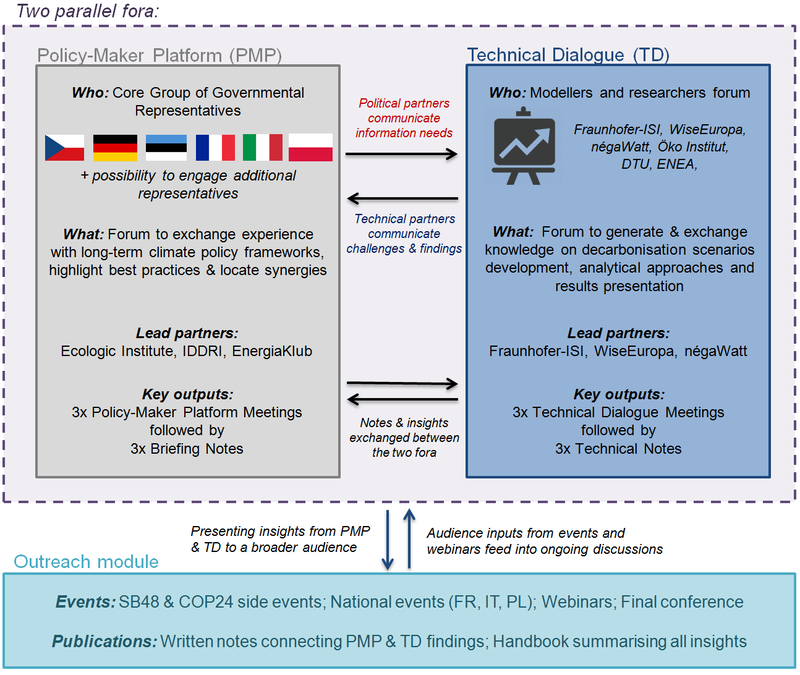 The two fora ("Policy-Maker Platform" and "Technical Dialogue") are closely interconnected: the policymakers will have a chance to communicate their information needs, while the technical partners will share their findings and explain challenges that they face. Notes and insights will be exchanged between the two fora, throughout the duration of the project. The project will be accompanied by a number of outreach activities, including webinars, side events at UNFCCC meetings and national events in various Member States. Updates will be available via the project website (launching soon). Initially, government officials from six countries (CZ, DE, FR, EE, IT, PL) have pledged their commitment to participating – but representatives from other countries are signalling their interest in the project as well. Ecologic Institute has gathered eight partners from six countries with a wealth of experience in EU climate change policy-making processes and related modelling and scenario development to provide inputs to the process. The project is financed under the first round of projects coming out of the "call for ideas" of the European Climate Initiative (EUKI), established in 2017 by the German Environment Ministry to foster intra-EU exchange on climate policy at all levels of society and policy-making.